The Aquaman trailer has screened and it may very well be arriving online soon. CineEurope is currently taking place and it's a place where studios can show off their upcoming slates for exhibitors, press members and some folks from the general public. Warner Bros. recently held their presentation at the event and, amongst other things, the long-awaited Aquaman trailer was shown. It's now being reported by several outlets that the trailer will arrive online soon and it could be just a matter of days. We've heard various rumors in the past about the trailer for the upcoming DC movie, none of which have produced any fruit. However, with the movie's release date set for December, it would make sense for Warner Bros. to get on the ball and get the hype train moving. As such, releasing a trailer in the not-too-distant future wouldn't be too surprising. Plus they just screened it at a major event and director James Wan has promised, albeit vaguely, that the trailer will arrive soon. While reports from various outlets right now are vague, stating that the Aquaman trailer will arrive in the "coming days," it's hard to guess exactly when that might be. Warner Bros. has the comedy Tag hitting theaters this weekend. Perhaps they'll release it online in time to debut in theaters alongside that movie? It's certainly not out of the question. 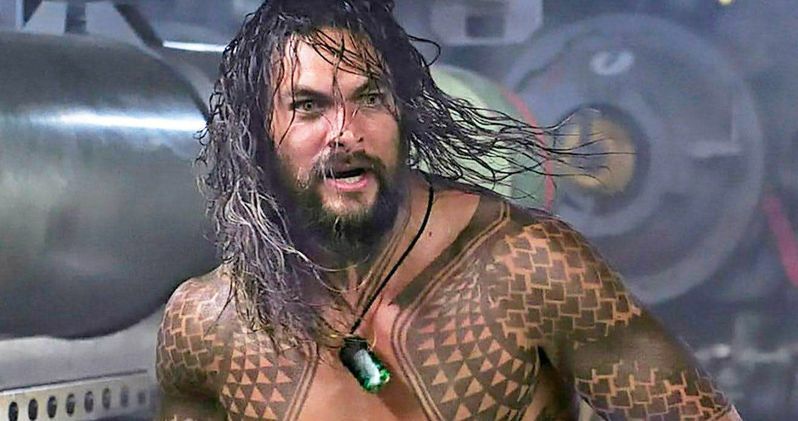 Or maybe, to the irritation of a great many people who just want to see more Jason Momoa in the world, Warner Bros. isn't going to release it just as soon as this makes it seem. Maybe it'll be more like late next month at San Diego Comic-Con, for example. Yes, San Diego Comic-Con is just around the corner and with Marvel Studios skipping out this year, Warner Bros. has an opportunity to have DC steal the show. So in many ways it would make sense for them to save the Aquaman trailer until then. But who knows? Perhaps they will release the trailer now (ish) and then show some extended footage exclusively for those in attendance at SDCC? They could also show a Shazam teaser at the event and tease some stuff for Wonder Woman 2. Whatever the case ends up being, we're not going to have to wait all that much longer for the trailer to arrive. Aquaman, which arrives on December 21, will be the first DCEU movie to hit theaters following the disappointment that was Justice League. That gives audiences more than a year to cleanse their palettes. Hopefully, this movie can rally behind a great director in James Wan and, much like Wonder Woman did last year, defy the odds and go on to become a great DC movie. In the next few days, we could have our first real look at the movie, which will give us a much better idea of what to expect. Just exercise a little more patience, DC fans. This news comes to us courtesy of The Hollywood Reporter.